Following is a collection of newspaper articles, published primarily in the Dallas Morning News over the past 60 years, relating to events, features and stories on South Beckley Avenue. If you have any additional stories or photographs of the time, please drop us a note and we will be happy to include your material. Mrs. O.F. Wolff, formerly Gwendolyn James of Streeter, Illinois lived at 1526 Beckley until 1958. She had moved to Dallas with her husband given his interest in the opening and development of the Beckley Club addition. E.C. 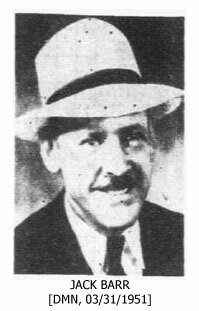 Tidwell, member of the Dallas Master Barbers' Association in 1929, and director of the Oak Cliff Barbers Association in 1939, lived with his family at 1606 Beckley. Louise Tidwell, E.C. Tidwell's daughter, was a bright Dallas socialite who graduated from the North Texas State College; she was member of the Future Teachers of America. Kathryn Livingston, employee of the Coca-Cola Bottling Company for 20 years, lived at 1614 Beckley - her daughter Lillian married a californian, Mr. LeRoie Woolley Jr. - member of the Pasadena band. W.G. Swindle, the man known for saying, “When I hit 'em they stay hit”, lived at 1502 Beckley. W.G. Swindle operated Swindle's Cafe in the 500 block of North Akard and was charged with murder in 1941. During a street fight over a parked car in front of his establishment, he fatally hit Jack Bond, secretary of the hairdresser's association and beautician operating next door to Swindle in downtown. A grand jury exonerated Swindle a month later. Two Dallas political groups Saturday officially entered the April 3, 1951 city election race to oppose the incumbent Citizens Charter Association ticket (he lost by a significant margin, editor's note). The Nonpartisan platform pledged to make City Hall a temple of democracy instead of a house of autocracy, give city employees cost of living adjustments, improve alleys for rapid removal of garbage and to reduce the threat of polio and other diseases; give Oak Cliff a police station and tax the penthouse at the same ratio as the poverty stricken shack; permit no hike in public utility rates until the general public's income is increased, and to settle the racial housing problem on a fair and common sense basis. Jack Barr was one of the leaders in the movement for annexation of Trinity Heights to Dallas and was a trustee of the old Trinity Heights school district. He had been in the contracting business ever since he came to Dallas at 21 years of age.